See your structure in near-zero visibility conditions! 360-degree acoustic imaging is a great tool to investigate the conditions of the underwater portion of a marine-based structure. Also known as a sector scan, these tools can create detailed images in water conditions in which there is zero visibility. 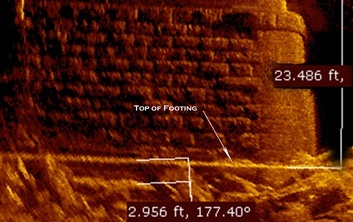 By stitching several of the images together, a complete picture of the underwater portion of dock, seawall, bridge pier, or cellular structure can be created. This, in turn, can be combined with above-water digital photography to create a complete image of the entire structure. Acoustic imaging can be completed on vertical surfaces such as piers, sheet pile walls, and abutments. It is also effective in gathering images of the river bottom to monitor scour conditions by changing the orientation of the survey head. J.F. Brennan Company specializes in marine construction projects throughout the inland waters of the United States. 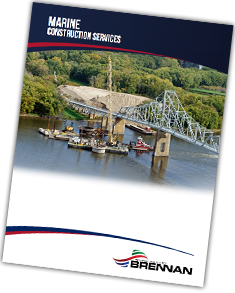 Download our brochure here to learn more about our deep foundation and pile driving capabilities. Want to know more about acoustic imaging? Fill out the form below!